The combination of deep breathing and stretching warms the body to relieve stress and promote feelings of peace. The surroundings in many yoga classes such as the lighting or music are used to create a relaxing atmosphere. No matter the type of yoga you choose to do, all styles are considered to help treat anxiety and depression and therefore promote inner peace and happiness. Proprioception is the ability to connect with your body through awareness of it’s positioning and space. By regularly practicing yoga, you increase your body’s positional awareness. This is achieved through the improvements made in posture and movement patterns. Not only could a better sense of your body help you stayed centered throughout the day but could also help improve your yoga abilities! Stress and everyday anxieties can truly have a negative impact on the immune system. By meditating, you can help remove these stressors and assist your body in reaching a positive healing state. Through the practice of breathing (or Pranayama exercises) the lungs become more efficient and the amount of oxygen to blood is increased. Better circulation of blow flow and filtration of toxins can be achieved through inversion poses. All of these practices help the body fight off infection and build a stronger immune system. Of course, yoga can aid in weight loss in the typical physical sense, but it’s true influence on weight loss goes much deeper. The way yoga promotes mindfulness and connection with one’s body helps individuals make better decisions to reach their goals. Yogis gain a deeper relationship with their body and tend to have an increased sense of self. This could help them make positive eating and activity decision. Not to mention, if you are participating in high intensity yoga, your likely burning many calories and increasing your heart rate! While these are all great ways that yoga can benefit you, there are many more! Yoga can set the foundation for a healthy lifestyle. By joining a studio, you may find that yoga can also help you develop a greater sense of community. We encourage you to join a local studio and see all the other benefits yoga has to offer you. 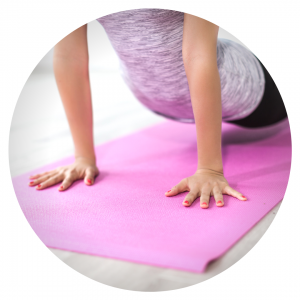 Visit Twisted Sister Yoga Studio to learn more about yoga, or if you are a local learn more about the events we offer in your area!